How Can I Clean My Invisalign in Lynnfield? You’ve probably heard of Invisalign in Lynnfield, which offers a wonderful orthodontic option for older teens and adults who wish to improve the alignment of their teeth but do not want to wear metal braces for two or more years. 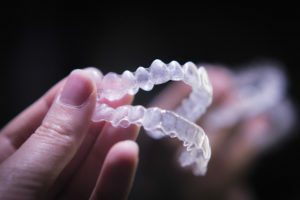 Sticking to the special Invisalign rules is key to zipping through the treatment without delay — and proper oral hygiene is of special importance. Keep reading to learn how to clean your Invisalign aligners as you make your way to a confident, beautiful smile. Invisalign trays (or aligners) are made out of a special sturdy plastic that you can clean with warm water and a clear anti-bacterial hand soap. You should rinse the aligners as soon as you remove them to prevent bacterial growth, and give the aligners a quick brush every time you reinsert them. You will also be advised to soak the Invisalign trays for 15 minutes once a day. Placing them in a denture solution or the special Invisalign cleaning crystals daily will keep your trays clean and fresh for the duration of use. Remember: Do not expose the Invisalign trays to hot water while you are cleaning. Doing so can cause the plastic to warp, potentially delaying your Invisalign treatment. It is as important as ever to maintain excellent oral hygiene during your Invisalign treatment. Clean your teeth after each meal to thoroughly remove plaque and any leftover food particles. Due to their tight fit, Invisalign trays can trap these substances against the tooth enamel and accelerate the rate of decay. Fortunately, it is as easy as ever to brush and floss your teeth effectively thanks to removable Invisalign trays. Simply pop them out at night and in the morning to achieve a thorough clean, every single time. Remember: You should brush your teeth for two minutes, twice a day and after each meal when you wear Invisalign. Floss at least daily, preferably after each meal. You don’t have to visit the dentist as frequently with Invisalign compared to traditional braces, but you will need to come in for a brief checkup every six weeks. Make sure you attend these visits, as it’s our time to check in and make sure you are progressing through the treatment as planned. Remember: If you do happen to lose or damage an Invisalign aligner at any point throughout the treatment, do not hesitate to get in touch with your dentist ASAP. The sooner the better to avoid significant delays. Follow these tips closely and you can easily advance through your Invisalign treatment without issue. If you have any further questions about Invisalign, or how to care for your aligners, don’t hesitate to get in touch with your cosmetic dentist in Lynnfield! Dr. Rob Schumacher is a trusted cosmetic dentist serving smiles in the Lynnfield area. To learn more about his restorative, cosmetic, and family dentistry services, you are invited to contact Schumacher Dental today at 781-334-3400. Comments Off on How Can I Clean My Invisalign in Lynnfield?